LePage, Ben A.; Middleton, Beth A.
Multidisciplinary approaches to climate change questions; 2011; Book chapter; Book; Wetlands: Integrating Multidisciplinary Concepts; Middleton, Beth A.
Jiang, Ming; Middleton, Beth A. Soil characteristics of sediment-amended baldcypress (Taxodium distichum) swamps of coastal Louisiana; 2011; Article; Journal; Wetlands; Jiang, Ming ; Middleton, Beth A. Soil warming alters seed-bank responses across the geographic range of freshwater Taxodium distichum (Cupressaceae) swamps; 2011; Article; Journal; American Journal of Botany; Middleton, Beth A.; McKee, Karen L.
Kusumi, J.; Zidong, L.; Kado, T.; Tsumura, Y.; Middleton, B.A. ; Tachida, H.
Multilocus patterns of nucleotide polymorphism and demographic change in Taxodium distichum (Cupressaceae) in the lower Mississippi River alluvial valley; 2010; Article; Journal; American Journal of Botany; Kusumi, J.; Zidong, L.; Kado, T.; Tsumura, Y.; Middleton, B. 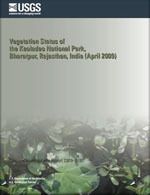 A.; Tachida, H.
Vegetation Status of the Keoladeo National Park, Bharatpur, Rajasthan, India (April 2009); 2009; SIR; 2009-5193; Middleton, Beth A. Effects of Hurricane Katrina on the forest structure of taxodium distichum swamps of the Gulf Coast, USA; 2009; Article; Journal; Wetlands; Middleton, B. A.
Regeneration of coastal marsh vegetation impacted by hurricanes Katrina and Rita; 2009; Article; Journal; Wetlands; Middleton, B. A.
Regeneration potential of Taxodium distichum swamps and climate change; 2009; Article; Journal; Plant Ecology; Middleton, B. A.
Ramsey, Elijah W.; Rangoonwala, A.; Middleton, B.; Lu, Z. Satellite optical and radar data used to track wetland forest impact and short-term recovery from Hurricane Katrina; 2009; Article; Journal; Wetlands; Ramsey, III, E.; Rangoonwala, A.; Middleton, B.; Lu, Z.